Some companies are still skeptical of incorporating social media into their business strategy. And they’re missing out. Social media is no longer the new kid on the block. With platforms like Facebook and Twitter being active for over a decade, social media has put down roots and is here to stay. Unlike any other form of marketing, companies have embraced social media as both a way to promote their business and as a means for engaging with their customers. In fact, companies that use social media marketing grow faster and increase their bottom line. If you decide not to invest the time building relationships with customers and prospects on these platforms, your competitors will. The imperative is clear: in an environment where 90 percent or more of B2C, B2B, and nonprofit brands make use of social media content, and more than 78 percent of adults online use social media, it should be a critical component of your overall marketing strategy. You cannot afford for it not to be. 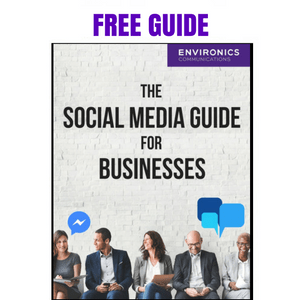 The Social Media Guide for Businesses offers digestible guidance on creating your strategy. Spend your lunch break reading and digesting the fundamentals of social media for high-growth companies, and you’ll gain a new perspective on how these platforms really work! Whether you’re just starting out or looking to hone your business strategy, this guide is a perfect place to start improving your social presence, no matter what your skill level.